See and Read Putts better with these special lenses! Welcome to our first installment of CaddyBytes Caddy Tips. Caddy Tips is our new weekly installment of weekly tips sure to help your enjoyment of the game! 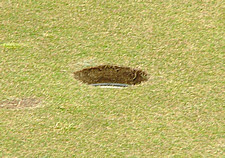 Our first installment of Caddy Tips is on the basic things you need to know about reading greens. 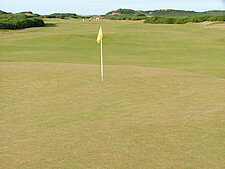 attention to the slope of the green between your golf ball and the hole. 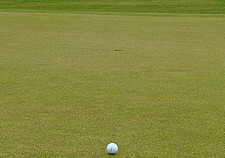 (Pictured Above) the golf ball will break dramatically from right to left. of the putt. 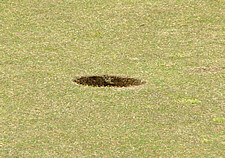 One view from the high side of the putt another and most importantly from the low side of the terrain. It's obvious that there is significant right to left slope in this putt. 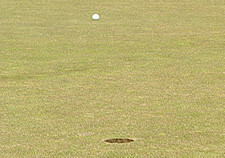 (Above Left) Here you are standing on the high side of the putt. Now walk to the low side view. Notice how more of the inside of the hole is not visible as it is in the previous view. The hole is obviously tilted away from you. 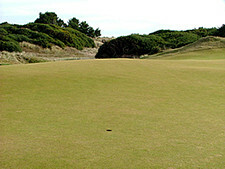 A putt from the left of this view, (Pictured above Right), would then break left, and from the right of this view would break right. Now you've got the basics on how to read the green. Remember first pay attention to the slope of the green as you walk up onto it. And pay particular attention to the slope between your ball and the hole. Is it uphill, downhill, right to left, or left to right? Two side it 'High side and Low Side'. How is the cup 'cut'? Does it break in more than one direction? If so factor that in. 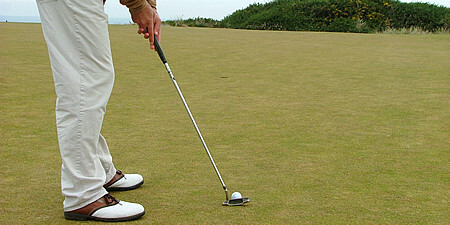 If the putt appears to double break account more for the slope where the cup is cut because as the ball is moving slowest near the hole it will break even more. Now line it up and try to get your speed correct. Remember: No one likes slow play. So do this as much as possible 'BEFORE it's your turn to putt. Have fun and may you knock 'em all in the hole!